On Saturday 5 May 2018, Bishop Séamus invited everyone to gather together and give thanks for the blessings that we experience in our Marriages and Families, but also to seek God’s tender and loving support in all of the difficult circumstances that we encounter in these relationships. 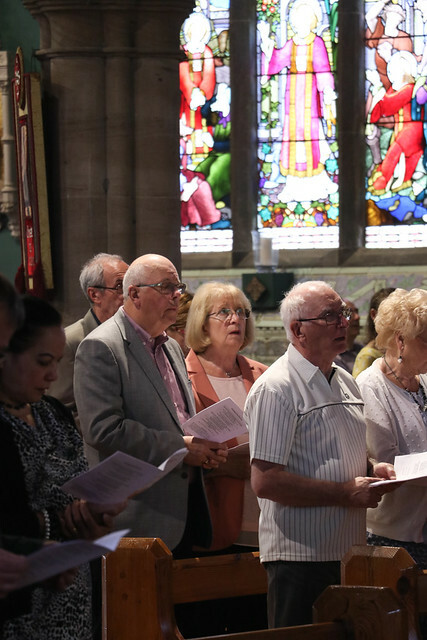 St. Mary’s Cathedral was filled with joy as couples, old and new, recently married or celebrating many years of Marriage were joined by their families while the Diocesan Choir led us in wonderful hymns of Marriage set to well-loved tunes. "No family drops down from heaven perfectly formed; families need constantly to grow and mature in the ability to love. This is a never-ending vocation. Our contemplation of the fulfilment which we have yet to attain also allows us to see in proper perspective the historical journey which we make as families, and in this way to stop demanding of our interpersonal relationships a perfection, a purity of intentions and a consistency which we will only encounter in the Kingdom to come. It also keeps us from judging harshly those who live in situations of frailty. All of us are called to keep striving towards something greater than ourselves and our families, and every family must feel this constant impulse. Let us make this journey as families, let us keep walking together. What we have been promised is greater than we can imagine. May we never lose heart because of our limitations, or ever stop seeking that fullness of love and communion which God holds out before us."